Described by National Geographic as “the most beautiful place on Earth,” the area offers a range of attractions, activities, and services. 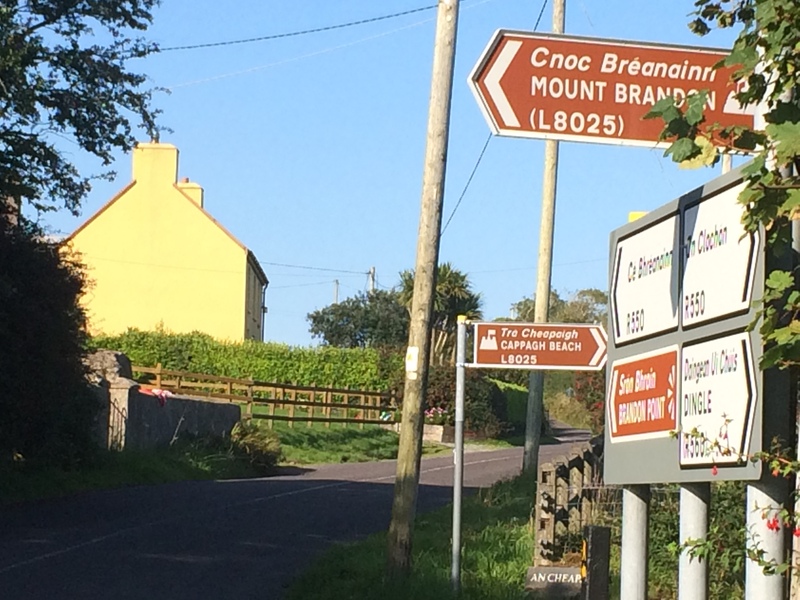 A mecca for walking enthusiasts, the area boasts walks of all levels, from the difficult Mount Brandon and Baile Dubh, to medium jaunts that include Sás Creek to Brandon Point and Sliabh Glas, to easy walks around the villages and beaches. Home to a unique artists’ trail, which is an easy-to-moderate trek to local artists’ studios and galleries. Some of the most rewarding (we hope!) fishing can be found in the Cloghane/Brandon area. The two villages cater to every type of angling—beach, lake, river, pier, and boat. There are beautiful and challenging spots for fly and anglers. Fly fish the Owenmore River for salmon or trout, travel down stream to Cloghane Estuary where you can dig for clams at low tide and fish for sea bass at high tide. Travel further on to Brandon Bay where a wide variety of fish can be caught (bass, ray, flounder, turbot, sea trout and mullet.) Personal boats (you operate) can be hired in Brandon where you can go deep fishing for cod, haddock, hake, ling, john dory and makerel. Surf angling is a lot of fun along the beaches of Brandon Bay. For more information on fishing on the Dingle Peninsula refer to Bob Moss’ Guide to Shore Angling on the Dingle Peninsula or visit his web site at BobMoss. A popular bird-watching area and home to the rare and much sought after red-billed chough and the white-tailed sea eagle. Also good populations of hen harrier, kestrels, and barn owls, to name a few. Wide range of waterfowl that is supported by our unique reed grass beds, including little egret, widgeon, brent geese, gannets, curlew, oyster catchers, and lapwings. Hedgerows of fuschia and Montbretia unlike anywhere else in Kerry. Large areas of intact blanket bogs to support the common Irish lizard. Playground: There is a small playground outside behind the Halla Le Cheile. Tinteán Ceoil: Traditional Irish fireside music sessions are held every Monday evening, every week of the year (twice a week in the summer) at the Halla Le Cheile Community Center in Ballyguin. It’s unlike any experience anywhere else. Maura Begley, a local musician, leads the evening, incorporating any and all who want to contribute to the evening through music, dance, singing, recitation, and whatever else strikes them. Or, you can simply be part of the inter-generational fellowship. Local children are a regular on the Monday evenings where they practice their latest tin whistle or accordion piece or work on some of their Irish dance steps. It is a completely unique experience. Visitors describe it as the “best thing I did in Ireland.” Why? Because it involves interaction with locals in a local activity. Former 007 Timothy Dalton is one of the most recent customers at a local artist’s studio. He added his name to a list of distinguished patrons of our local art. Castelgregory Golf & Fishing Club castlegregorygolf is 10km from Cloghane and is a links course by the ocean. Dingle Golf Links dinglelinks , nested on the edge of Ireland’s dramatic southwest coastline, Dingle Links is a special place to visit. Learn or improve your windsurfing, surfing, kitesurfing or SUP with Jamie Knox jamieknox – ex World Tour Professional and his dedicated team located in the Maharees. Fermoyle Beach is also a popular spot for surfing. WaterWorld (Maharees) offers diving courses for all levels and is open all year. Visit Waterworld for some of the best diving in the world. There are local equestrian centers in the Maharees, Dingle, and Tralee. Check out LazyB Ranch in Brandon and Burnham Riding Centre in Dingle. Cappagh beach is 600m from the cottage and offers a sandy beach that is fun for beach combing and paddling at low tide. There is also a paddling area by Brandon Pier, including an area for launching a kayak, canoe, or motorboat. Fermoyle Beach is a fun spot to surf, swim, or go boogie boarding. Halla Le Cheile Community Center: located in Ballyguin, halfway between Cloghane and Brandon on the main road. A variety of camps, classes, and events for adults and children take place during the year. Self-drive boats are available for hire at Brandon Bay Boat Hire in Brandon, +353 (0)87-2483606. You can also launch boats, canoes and kayaks at Brandon Pier. There is a marina in Dingle, just a 20-minute drive over the Conor Pass from Cloghane, where you can learn to sail at the Dingle Sailing Club. There is no better way to explore the area, and there’s plenty of room outside the cottage to park your bike.